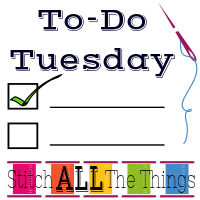 Welcome to To Do Tuesday October 18 hosted by Christine over at Stitch All the Things. Last week was Homecoming at the girls’ high school, and we had all kinds of craziness going on. Friday was Senior Night for Volleyball and Cross Country, and Saturday was Harley’s last home volleyball game (ever – *sniff*). Even with all the crazy, I did manage to sew quite a bit. I have progress to share for To Do Tuesday October 18! I still haven’t made any progress on this project, but I am ready to get it done. I re-measured Reagan, and I have re-drafted the flat pattern pieces, I just need to make the muslin now to make sure it fits. If it does, then I can make the dress she has been asking for and cross this project off my list! I didn’t work on this project at all this week, either. Now that volleyball is nearly finished, I will have more time to work on personal projects. I am really excited for this month’s TSNEM because months ago I bookmarked this group of posts from Erin at Why Not Sew?, and I finally get to follow her tutorials! I didn’t make a whole bunch of progress on this project, but I did get the fabric pulled and set aside for cutting. I was nearly done with both of the Aurora shirts last week when my sewing machine quit working. I tried everything I could to get it to work that night and the next morning with no results. The next evening when I got off work, I headed home planning to submit a warranty service request, but it was working perfectly. Weird! I immediately sat down to sew, and not only did I FINISH two Aurora T-Shirts from Hey June Handmade, I also completed a Union St. Long-Sleeve V-Neck T-Shirts, as well! First Up, the Union St Long Sleeve. 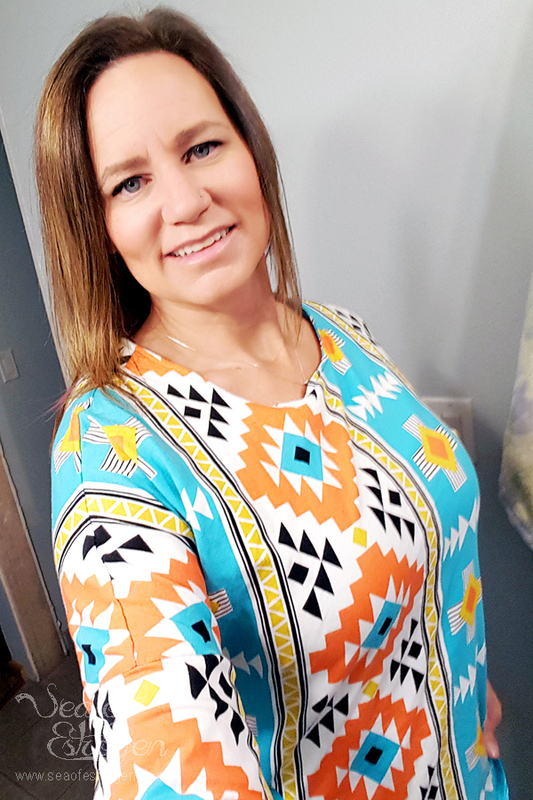 I love this shirt – it is by far one of my favorites to make AND wear! The Aurora T-Shirts have two options, and I made both shirts with Option B, which includes an insert at the lower side seam. I chose contrasting fabric for both inserts, though now, I wish I would have chosen orange or black for the second one. This version is made of a knit that wasn’t as stretchy or as thick as I am used to. I had a lot of trouble with the fabric tearing and catching on my needle even though I was using the correct needle type. I made this one from Riley Blake Four Corners knit in turquoise. 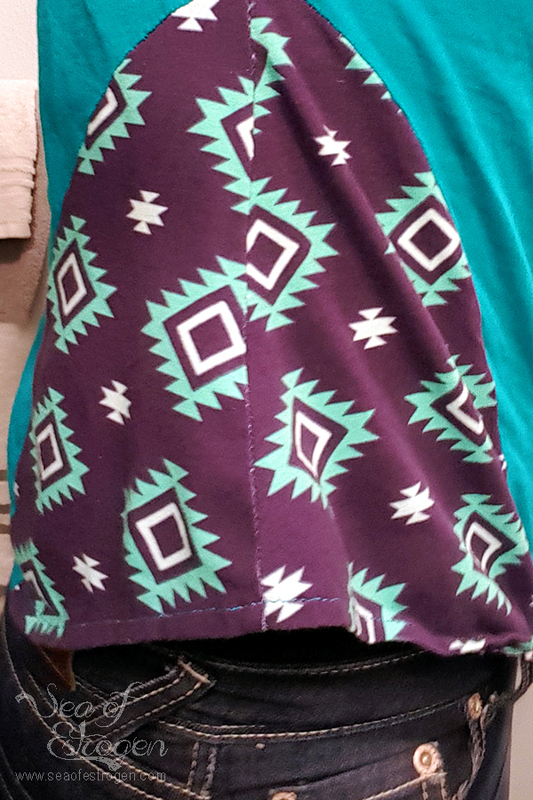 I like this shirt, as well, but I wish I would have used a different color for the contrasting panel. In addition, I thought I would like the vertical stripes, but I think I would have preferred them horizontal. 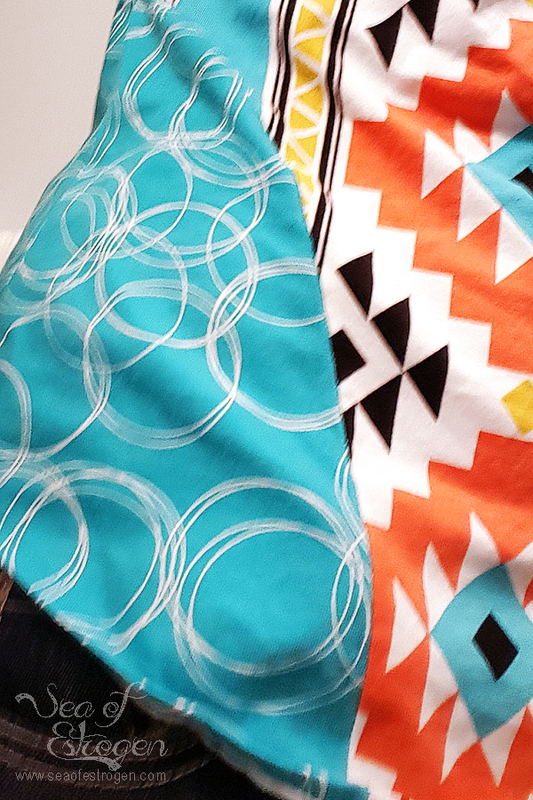 You’ll have to excuse the crummy bathroom selfies because I kept forgetting to take pictures of me wearing them, but they’ll have to work for now! My list for this week is nearly identical to last weeks because I only finished one of my projects. In the spirit of completing some 2016 Quarter Four Finish-A-Long Projects, I am adding the three Patterns 4 Pirates Slim Fit Raglans I have planned to my list. I have the Women’s Raglan Add on Pack pattern, as well, so all three shirts will be different versions of the raglan. As a bonus, I thought I would share this picture. 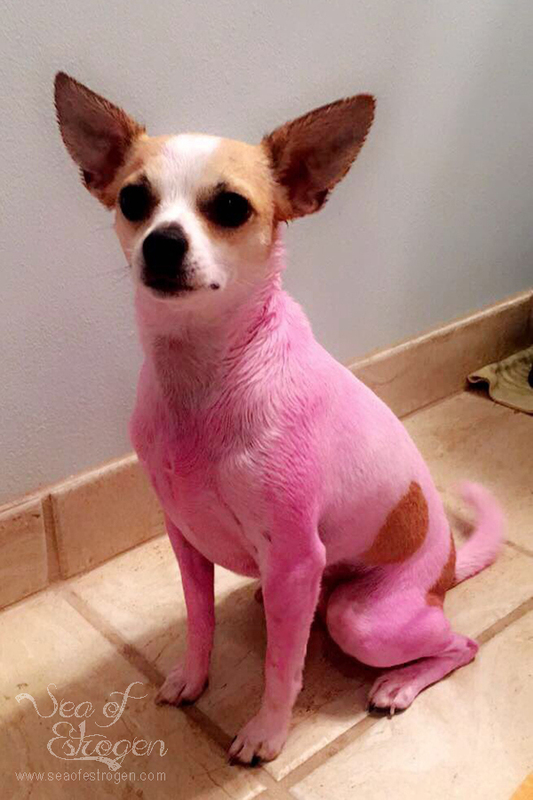 Harley got bored Sunday afternoon and decided to dye her dog pink (don’t worry – completely safe, vegan dye). Pip is a little blotchy, but she’s definitely pink! Even though it’s been a few days, it’s still startling to come home and have a hot pink dog come running at me! Poor Pip! Poor Pink Pip! Okay, first… Pip is adorable in Pink. 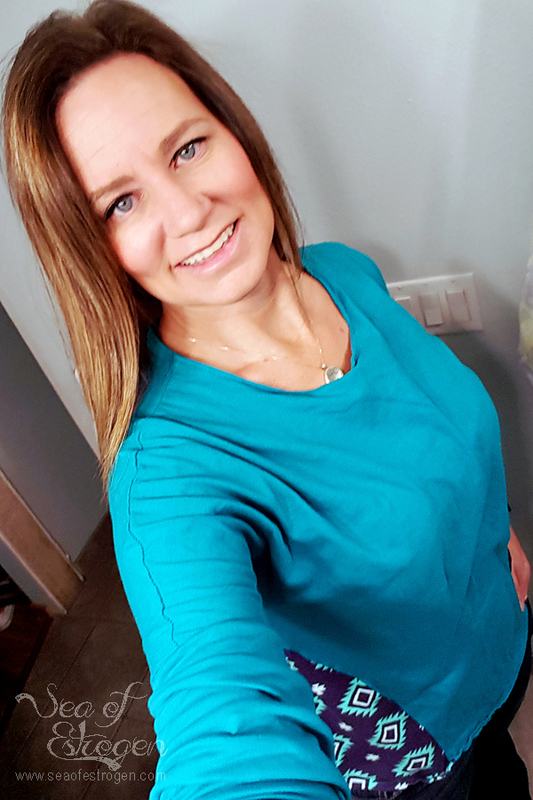 Love a great v-neck long sleeved shirt, and yours is awesome! I really do need to get to work on making some t-shirts. 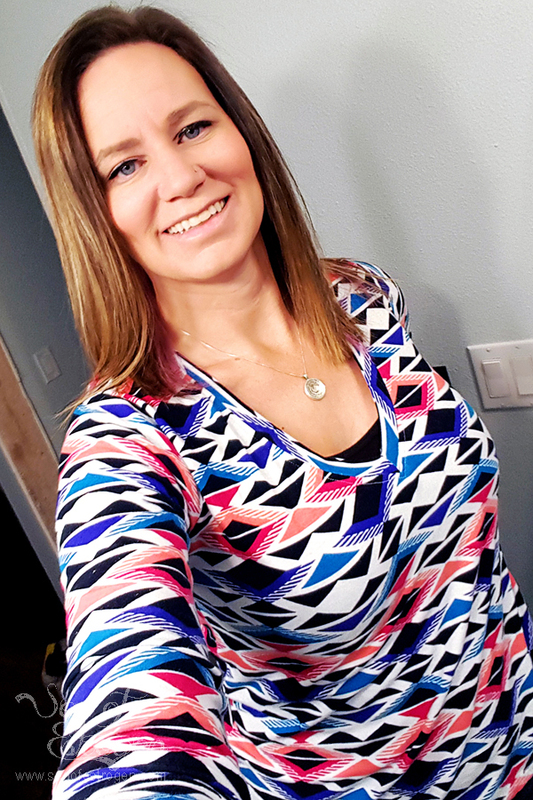 v-necks are my favorite and I always have the hardest time finding one that fits right. I am bookmarking the patterns for later! Pip is pretty adorable, and I don’t mind indulging Harley – I mean if that’s the worst thing she ever does? I have a hard time finding shirts that fit well, and I absolutely love the Union St. I could probably fill my closet with them and never get bored with my wardrobe. I also really don’t like crew necks, and Adrianna’s v-neck tutorial is the bomb.com! OK, pink Pip is adorable. I’m thinking orange come Halloween? Oh, and congrats with completing another year of volleyball! My youngest was a three-sports girl and volleyball was my favorite to watch. She’s a Jr. in college now. Love your t-shirts! Were do you purchase your fabrics? I love the mix of fabrics you used. I must (sadly) admit, that the last t-shirt I made shrink up to midriff length when I washed it! Kind of turned me off to future attempts. Do you pre-wash? Well, the dye Harley used is temporary, but only washes out, and I don’t think she’ll have enough baths before Halloween. Maybe for Thanksgiving, though! I do pre-wash my fabric, and usually in pretty hot water so I know they’re not going to shrink again. All of the t-shirts I have made so far have been Cotton/Lycra blend from Peek-A-Boo Fabric Shop or Fabric.com. I have made a few here and there from knit I got at Wal-Mart, but they definitely don’t hold up as well.